My efforts to understand and use the machine without reading the instructions back to front and after having taken the machine apart piece for piece, cleaning it and putting it back together, see previous post. The CK 35 is quite different from the previous models in so far as it doesnt have patterns stored in the memory of the main and needs to be feed with patterns via the cartridges which in turn have to be programmed through the PPD 35. 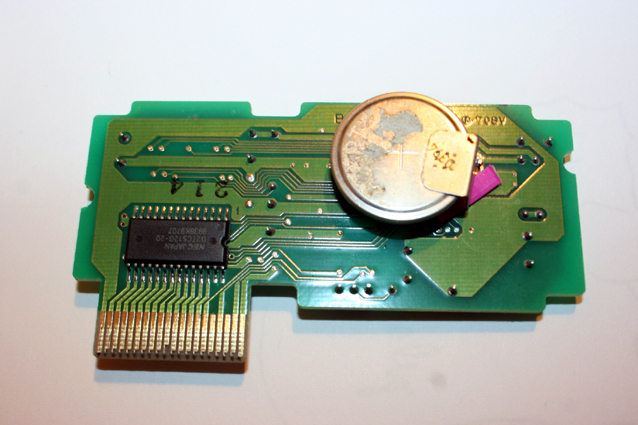 How much can be stored on the cartridge is still not discernable but since the whole patterns are designed in “pixels” it probably doesn´t need much capacity. Once you downloaded the patternes into the machines you can start knitting and you can programm the motor to knit the selected amount of rows. Detach the cartridge and go. If you attach a new cartridge to the main bed it will automatically delete all information in the main bed storage. 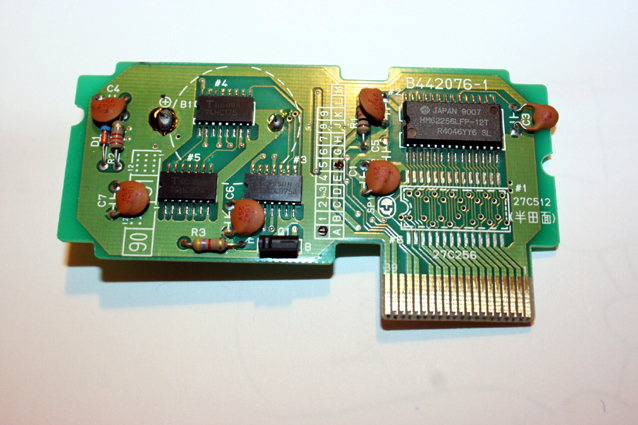 You can also upload all information on the main bed into another cartridge. Watch the (russian spoken) video here from 2010 on youtube! Speed on the CK 35, here is a video with use of the colour changers (about the same speed as single bed use). Here is a video in russian from Sep 2013 that looks like an introduction to the ck 35. It gives you a good view of the programing panel on the main bed. c)Program the motor to knit more than one row by entering row numbers after pressing the repeat button, then press the snake arrow button. If you don´t program the motor it will only knit one row at a time. The option of attaching a foot pedal to the motor is possible but I can´t test it as I don´t have one. How the buttons influence the foot pedal and viceversa I dont know and won´t speculate. The motor will as a default go to maximum width past the colour changer. For slimmer knits it means that you will get tension problems in the knitwear. The edges will have tenser and looser rows. f you are using less than 200 needles it is worth programing the motor for a slimmer width but you can only do that via the PPD 35. It is not possible to do that on the main bed. Here a video with reduced width from 2012. It has the usual dial as on all other models but I have noticed that you can go past the 0 and 10 tension and that is different in each machine. For example tension 7 on my kh 820 model is the equivalent of 8 on my kh 830 and tension 9 on the ck 35. The Ck 35 has a different yarn holding system with a knot and yarn rip notifier that stops the motor dead right away. That means that there is stronger tension holding the yarn because it passes through 3 more places that build up more tension than in other models where you have a single yarn mast. If you don´t/can´t program the motor to a slimmer width it also adds to the tension (and adds problems). It´s really cool to have the workload taken off by using the motor but it doesnt really leave you free to do anything else that requires a lot of attention. Something will always go wrong and when you have knitted 200 rows (or depending on the height of your machine stand), you will have to rehang the comb and weights. Best to be seated in view of it and do minor workstuff or drink tea and enjoy the view. Using the motor will increase the amount of noise (as you probably herad in the videos) so protecting your ears if you stay in the room is a neccessity and placing the machine so as not to disturb others! 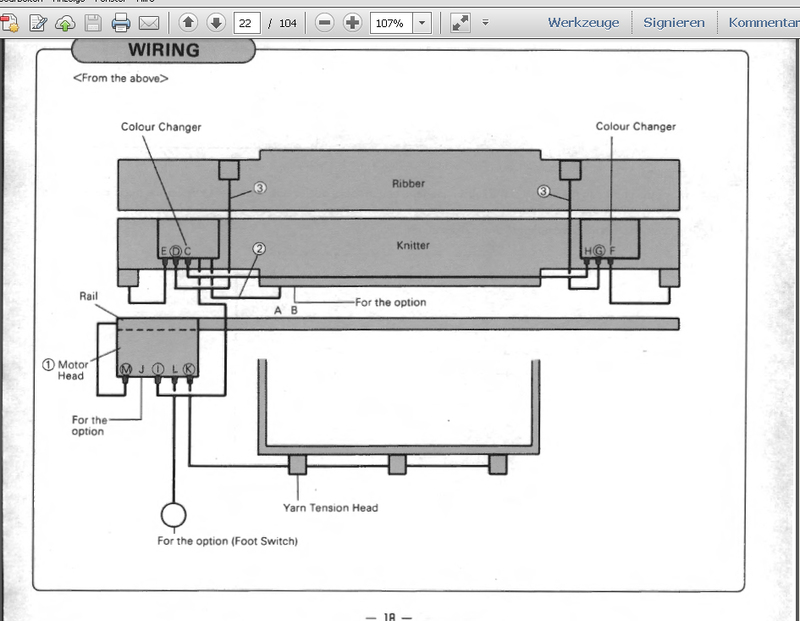 I have had the opportunity to leaf through the english and the german version and the german version has a better language knowledge and more precise naming than the english one.See below eg instead of cables it´s “wiring” and instead of in optional/for future functions it´s “for the option”. They both have the choppy dynamics of instructions eg you jump bakcwards and forwards for simple processes and even jumping from Ck 35 to PPD35 instruction books is neccessary for some informations. A more strealimed and a more step by step instruction would have been more user friendly. Once the machine is hacked it will be neccessary to rewrite the instructions anyway. BUT despite all this it is worth while to buy one if you can get it. i is relativly simple to use if you know your way around brother knitting machines and need a machine to do a lot of work. It is also capable of using 4 colours in a row and has 6 colour holders. It does with ease what you have to squeeze out of the previous models such as jaquard knitting. The cost of getting a previous computer model with double bed and motor can be around € 2.500 and even if you get the combo cheaper you dont have the automatic colour changers in it. And lots of parts are still available on ebay (although a lot of parts are identical to previous models such as the bed and pattern mechanism, needles, accessories, weights…). Currently my machine is being hacked by two pros which means that I will be able to attach my pc to it. Pattern design and control of the machine are then done through the pc. Patterns are stored on the pc, the position of the carriage, row counting are done on the computer, such as motor and colour changer control. I will post more information as the process continues. It would be great to have a network of CK 35 owners since there a only so few of these machines. There have been some exciting new developments concerning the hack of the brother machines that I will blog about soon. You will be able to use the machine with your computer. Maybe they will change your mind otherwise I will help find a new “home” for your machine. How much you wont for ck35? Hi, sorry I just read your email. I would like to get $3,000 Dollars because I hasn’t been used practically, I only knitted few swatches never a complete garment or item. The problem is that I only accept pick up from my home, I had a very bad experience when shipping an item in the past. You’ll have to come to my house, try the machine and only then you can buy it, I don’t accept returns either. Assigned sockets on the main bed and motor – preparation for automatic shift beds (racking). Foot switch is simply bell button, as well as blue S/S (By the way, it sometimes dies). You do not rehang comb when you have the engine move down. Different tension – shorten the spring. Hi Victoria, I am also an owner of a CK 35 but up till now have not have space to set it up. I already use several other Brother/Knitking machines, motor drive, etc. I am very interested in hearing about using my computer for patterning. I already have a dedicated laptop for machine embroidery. PPD 35 can be connected to the analog card in PC and is very simply. That´s good to know. I would like to write to you later with questions about brother and the machines. Nebylo by to jednodušší rovnou česky? If anyone is interested I am selling my knitting machine Brother CK 35?! You can contact me vie e-mail: savadinovic@hotmail.com for more information. is there anybody out there in CK35-universum? I bought mine a year ago. And slowly I am collecting knowledge, but there is a long way to go. Help is welcome. I have a CK-35 knitting machine which I haven’t used but to make few swatches. Today I tried to use it and when the carriage tried to pick up the yarn holder, the yarn holder fell and did not stay in the carriage to be transported to the other color changer’s yarn holder keeper. This happens with two yarn holders only 2 and 4 from the left side. Does anyone know how to fix this problem? Does anyone know where I can buy yarn holders for the CK-35? I have tried E-Bay and the internet buy no luck. Sunny Choi has them http://shop.sckmcl.com.hk/ but super expensive. I was thinking of 3D printing them. As for your other problem I haven´t used it yet as I am still waiting for it to be completely hacked and connected. Thank you VLPDESIGN but no, he doesn’t have them any more, I got a refund because he run out of them. Yarn holder keeper or catcher assembly? I have both the color changer and against catcher metal teeth. Catcher not. In Czech republic. I have 15 brother ck35 machines i want to sale them i anybody intrested contact me on whatsapp.0096896391053.